Air Penguin is the type of game that forces people to reconsider the power of iPhone gaming. It offers simple tilt controls, lengthy gameplay, and is priced for an impulse buy at 99 cents. Most importantly, Air Penguin is really, really fun. Air Penguin begins with a short storyboard showcasing the separation of several penguins via broken up ice platforms. It’s then your job to find all of the young and helpless penguins by traversing through the various stages of the game. You’ll do this by jumping from each ice platform by tilting the device in any direction and avoiding any obstacles, enemies and water. Yes, penguins normally can swim—however, this one must have traded that ability for his incredible front-flip skills. 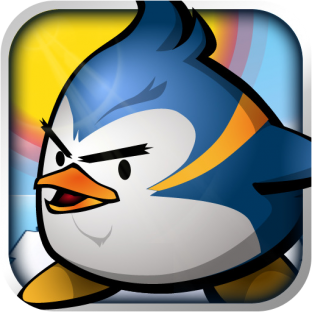 Air Penguin offers 100 stages divided up into several levels, which progress in difficulty as time goes on. Each stage contains a maximum of five fish that players can acquire. 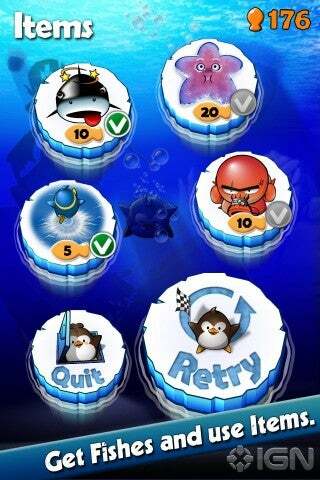 Retrieving each fish quickly results in a bonus multiplier that contributes to the layer’s overall score. Gathered fish also double as currency to purchase help during levels. Players may break from the original story mode and attempt a high score on the survival mode. The survival mode has various obstacles throughout, and measures your ability to travel the farthest distance without dying. Players will have to be careful of multiple enemies, such as leaping sharks who will eat you, flying fish who will spear you, and blubbering seals whom you will bounce off of. Fortunately, there are some friends that the penguin can mooch off of, such as whales and turtles, who will make your journey a little easier at times. The first thing players will notice when playing this game is how tricky the controls are. During play, there are no buttons to press and no sliding finger skills required—just the tilting mechanic. However, players quickly catch on and the gameplay becomes quite fun. For those still frustrated with the sensitivity, there is a setting that makes this more manageable. In fact, there is even an option that pauses the game whenever players receive a text message, which provides a three-second countdown timer before resuming. It is small touches like these that allow players to focus on playing and less time yelling at the game. However, despite being mechanically solid and visually excellent, Air Penguin seems to take itself just a little too seriously. The enemies and allies in the game are true to real life, but are typical or a little cliche, and there is zero humor in the gameplay. Not that every game requires this, but it feels like Air Penguin could use just a bit of it throughout the game. Then again, there is the slightly annoying “whoo hoo” that the penguin says upon each level’s completion. Regardless, Air Penguins is a very fun game overall. The game’s visuals are fantastic and the music will remind many of Kingdom Hearts. The game is challenging and can even be slightly frustrating at times (cursed flying fish), but is overly enjoyable. GAMEVIL does a great job communicating the interface icons without text, but some of the purchasable items and their uses can seem a little vague at times. Bottom Line: Despite a few annoyances, Air Penguin is a solid, visually brilliant game that is more than worth it’s 99 cent price tag.